The 2019 Rural Locum Forum has something to offer everyone interested in rural locuming in BC. For those who are experienced locums, it offers the opportunity to network and connect with peers, colleagues, and medical leaders to share information and learnings. For physicians new to rural medicine or who are transitioning from full-time practice, it’s an opportunity to learn more about the joys and challenges of rural locuming, and to connect with those who are already experienced. The fee for the forum ($75 for physicians, $25 for residents) includes a networking lunch with your colleagues. Accredited for 4.0 Mainpro+ credits. This event is being held independently of the BC Rural Health Conference. If you are only interested in attending the Rural Locum Forum, sign up using https://www.eply.com/RLF2019. 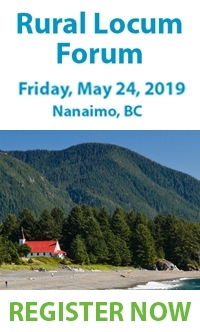 Otherwise, if you are attending both the Rural Locum Forum and the BC Rural Health Conference, you may sign up for both events at the same time on the UBC CPD web site. Please note that there is JSC funding available for physicians and residents attending the 2019 Rural Locum Forum. Details here. The Rural Locum Forum is co-hosted by the Rural Coordination Centre of BC and the Rural and Remote Division of Family Practice.